So the trade deadline has come and gone, and it was a relatively quiet one. There were plenty of deals, but not much you'd try to call a blockbuster. Several of the bigger names on the block didn't go anywhere, and most teams decided to tinker, at most. So while chances are your favorite team did something – well, assuming you're not an Islanders fan – you might have been left wishing they'd done more. But then you probably reminded yourself that plenty of teams have had quiet deadlines and then gone on to successful playoff runs, or even Stanley Cup wins. Teams like the 2007 Ducks and 2008 Red Wings didn't do much at the deadline, and they won it all. Your team could, too. And that's all true. But there's another side to that coin: Sometimes, teams follow up a quiet deadline with the sort of playoff run that leaves them wishing they'd been more aggressive. Maybe it's an early exit, or maybe they come agonizingly close to a Stanley Cup. Either way, they're left wondering: What if we'd done just a little more? Here are five teams form the salary cap era who may wish they could have a deadline do-over. At the deadline: On the morning of February 28, the Canucks woke up in first place overall and sitting with a 14-point lead in their division. They led the league in goals scored, and only two teams had given up fewer. It seemed like a classic case of "If it ain't broke, don't fix it" that called for nothing more than minor tinkering. What they did: They added a little bit of depth up front, bringing in Maxim Lapierre and Christopher Higgins in exchange for picks. At the time, most of us figured that was just fine. But then… : We all know how this one ended. The Canucks drew a first round matchup with their long-time rivals, the Blackhawks, and nearly blew a 3-0 series lead before Alex Burrows' Game 7 OT winner salvaged the series. Wins over the Predators and Sharks sent them to the Cup final, where they took a 3-2 series lead over the Bruins before collapsing in the last two games, coming up one win shy of their first ever championship. Would a more aggressive deadline have paid off? We'll never know for sure, and it's worth pointing out that many of the bigger names moved at the 2011 deadline didn't exactly pan out – think Dustin Penner and Bryan McCabe. But it's also true that the Bruins were the far more aggressive team leading up to the deadline, making five trades and adding names like Rich Peverley, Chris Kelly and Tomas Kaberle. Did that make the difference? It might have. At the deadline: The Sharks went into deadline day tied with the Bruins for first place overall, and sitting a ridiculous 25 points ahead of the Ducks for first place in the Pacific. They were gunning for their fourth division title in seven years and were on pace to finish well over the 100-point mark for the third straight season. The Sharks had been aggressive at the last two deadlines, trading first round picks for Bill Guerin in 2007 and Bryan Campbell in 2008. But with a growing reputation as playoff disappointments, some wondered if this was the year Doug Wilson went all-in. 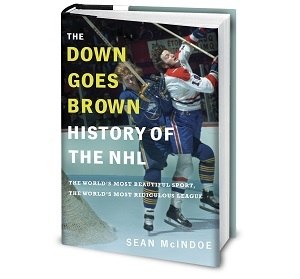 But then… : After finishing with a league-leading 117 points to win their first Presidents' Trophy, the Sharks imploded in the first round, losing in six games in what stands as one of the bigger upsets in recent NHL history. To make matters worse, that loss came against the same Ducks team that had served as the sellers in their only deadline deal.